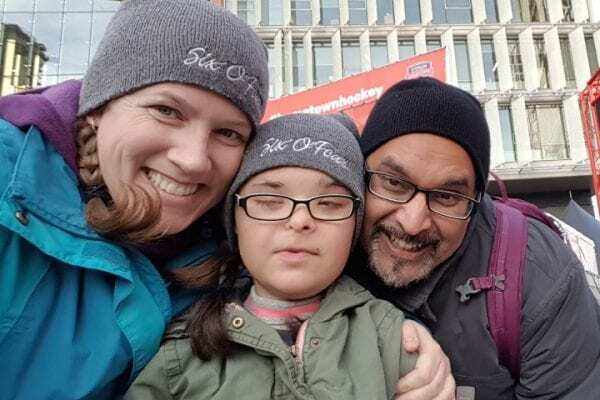 She is also diagnosed with CHARGE syndrome, a genetic condition that delays development, and is often associated with a number of life-threatening birth defects. Jayda is non-verbal, using gestures, signs, and symbols to communicate. Her cardiac condition requires a pacemaker, and she tires easily. Doctors said that she was unlikely to ever learn to walk, take part in everyday activities, or eat orally. In 2004 her dad was told she only had six months to live. But she’s proven all of those predictions wrong. Her dad, Paul, describes her as being full of life, persistent, and always willing to try new things. So for Jayda and Paul, a Best Day Ever with Canuck Place Children’s Hospice is an adaptive adventure. Jayda attends parties and other events thrown by Canuck Place throughout the year, socializing with other families on the program. Paul loves seeing her getting to do typical teenager things like attending concerts and riding roller coasters that other kids, without disabilities have an opportunity to do. You can help provide more adaptive adventures for Canuck Place families like Jayda’s. Donate today.